Loving the "road" I drew on the back of one of my husband's t-shirt. My husband gets a "car massage" while the little man has a blast playing. Very clever idea I came across while browsing Pinterest, of course. The silly lunch "bugs" I purchased from Perpetual Kid. Little man picked it up and did laps around the house saying "I got a bug! I got a bug!" Loving the amazing recipes I find on Pinterest. Yesterday I made Nutella Truffles and they are absolutely amazing! If you are interested in making some, click here for the recipe. 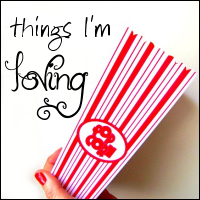 If you want to join the "Things I'm loving" fun and share what you are loving, click on the picture below. Such a great idea with the T-shirt. My husband would have loved that. Maybe when grandkids come along!!! Truffles look delicious. Might need to give them a try.